Your Wireless Video Camera has numerous capabilities, including a feature that allows you to schedule the time when the camera would take videos. This article will guide you in setting up the Recording Schedule feature on your Wireless-G Home Monitoring Camera Utility. Double-click the Wireless-G Internet Home Monitoring Camera Utility icon at the bottom-right corner of the screen. NOTE: In case you do not see the icon, install the Internet Home Monitoring Camera utility. For instructions, click here. In the Viewing Area, click the Setup button. 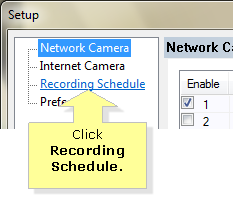 In the Setup window, click Recording Schedule. Under Make Schedules, select the name of the camera from the drop-down menu for Select a Camera. NOTE: In this example, the name of the camera we used is My Camera. Click the drop-down arrow for Schedule Interval then, select the interval of your preference. NOTE: In this example, the interval we selected is One Time. On the Start Date(mm-dd-yyyy),specify the date to start the scheduled recording by clicking the drop-down arrow. NOTE: In this example, we selected 10-19-2010. Click the up or down arrow for Start Time(hh:mm) to adjust the start time of the video that you wish to take. NOTE: In this example, we set the start time to 19:18 (7:18PM). 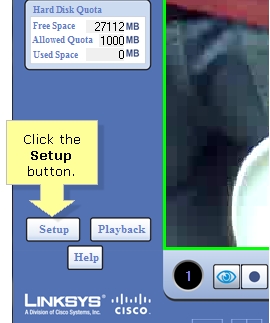 Click the drop-down arrow for Duration(hh:mm) then select the duration of the video that you wish to take. Once done, click the Add button. NOTE: In this example, we set the duration to 10 minutes.